And there’s even a warm place in my heart for That Cold Day in the Park (1969), one of Altman’s very first features, an undeservedly obscure drama that percolates with a eroticized sense of danger while a repressed wealthy woman (Sandy Dennis, arguably her last great performance) offers dubious sanctuary to a seemingly homeless young man (Michael Burns). But, hey, let’s cut to the chase: It would be foolish to pretend that any of the aforementioned titles hold a candle to the three movies that ensure Robert Altman’s immortality. Then there’s Nashville (1975), maybe Altman’s greatest film. Even more than American Graffiti, this intricately constructed and densely populated comedy-drama is repeatedly evoked by critics and showbiz journalists in discussions of any film with an ensemble cast, a tangle of interlocking subplots, and a pop-tune soundtrack that propels and underscores the action. It’s difficult for any filmmaker – indeed, it was difficult for Altman himself – to avoid unflattering comparisons to this teeming whirligig of a movie while working in a similar vein on a comparatively large scale. (Paul Thomas Anderson mischievously acknowledged the Altman influence with his wink-wink, nudge-nudge casting of Nashville co-star Henry Gibson in Magnolia.) And it’s next to impossible for anyone – though Anderson comes pretty damn close – to keep as many elements juggled as gracefully as Altman does here. Last but certainly not least: The Player (1992), Altman’s career-reviving “comeback” after a string of b.o. under-achievers, which enabled the filmmaker to vigorously gnaw on the hands that fed him during the glory days of M*A*S*H and Nashville, then backhanded for more than 15 years afterward. It’s a thoroughly nasty masterpiece, a smart and savvy satire about making movies, destroying lives and getting away with murder. But you don't have to hate Hollywood to love this bleakly, viciously funny story (adapted by scripter Michael Tolkin from his own novel) about an amoral studio mogul (Tim Robbins) who is stalked by a disgruntled screenwriter. Even if you don't catch all the inside jokes or informed references, you can still enjoy The Player for its sheer entertainment value as a modern-day film noir thriller with an abundance of cynical wit and a galaxy of bit-playing superstars. It’s worth noting, by the way, that The Player was considered an odds-on favorite for a Best Picture of '92 nomination until the very day that Oscar nominations were announced. Perhaps the Academy members wanted to send a message: You can gnaw on the hands that feed you, but don't try to chew them off. 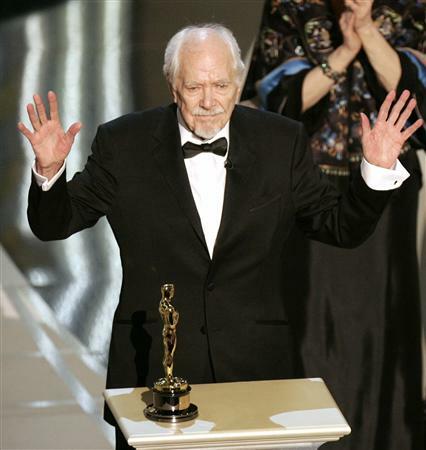 No doubt about it: Robert Altman wasn’t the warmest-hearted auteur in the grand pantheon of great filmmakers. (He's wasn't the easiest to interview, either -- just ask Jeffrey Wells.) Indeed, I once wrote that he often came across “as an acerbic cynic who views his characters -- and, to a large degree, his audience -- with equal measures of condescending bemusement and sardonic skepticism.” He struck me as even more irascible, if not downright bellicose, during my occasional interviews with him over the years. (He never tired of taking potshots at Texas, evidently assuming -- wrongly -- it's my native state.) This never affected my reaction to his work – well, OK, hardly ever – but I learned the hard way that there was some truth to cautionary stories (many of them fueled by his legendary break with critic and one-time champion Pauline Kael) that warned of a Robert Altman who never forgot, and rarely forgave. Point taken. But I will add this: Even if you don’t think each one was a great film, you must agree that each was made by a great filmmaker. Robert Altman will be missed, to be sure, but he also will be celebrated -- today, tomorrow, for as long as people care about cinema. A director may die, but his movies remain forever in the present tense. an excellent tribute and commentary as always, joe. i was saddened to hear of his death. my first thought genuinely was, "thank goodness they gave him that honorary oscar in time." "nashville" is my favorite of his films. turner classic movies shows it from time to time, uncut and commercial-free, of course. i hope to see it again soon. At the risk of sounding really, really crass -- I wonder if he'll get at least a Best Director nomination this year for Prairie Home Companion?